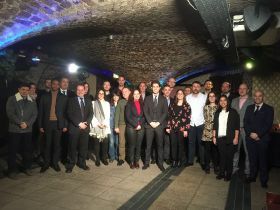 Fruit and vegetable exporters from Spain, Colombia, Italy and Belgium met with UK importers, wholesalers and retail buyers this week at London’s historic Ivory Vaults for the 5th International fresh produce trade mission organised by Tradex International. Stonefruit and topfruit producers from the Aragón region in north eastern Spain featured heavily in this year’s programme, with companies like Frutas La Rinconada, Frutas Lozano and Hermanos Miguel García looking to establish direct contacts with UK retailers and extend their coverage of the market. Also present for the first time was Colombia’s Frutafino, a leading importer and distributor that recently moved into the export arena. The company is hoping to make a splash in the market with its Hass avocados, Honey Gold pineapples, Persian limes and a wide range of exotic fruits. Italy’s Fingerlime showcased its innovative fresh and processed range of finger limes, which it is looking to position in the horeca and wholesale sectors as well as with high-end retailers. “We’re the only company that can supply finger limes 52 weeks a year. Our grower consortium in southern Italy produces the fruit between September and January and the rest of the year we import from Australia,” explained Jacopo Dominissini. Another Spanish company seeking greater market diversification is Albacete-based Neofungi, which produces white, chestnut, Portobello and shitake mushrooms in a range of formats for the retail and foodservice sectors. With an annual output of 22,000 tonnes, the company already supplies around 50 per cent of the mushrooms consumed in Spain, as well as customers in Portugal and France, and will volumes growing every year, it is keen to explore new opportunities. “The climate in Albacete is much drier than in Northern Europe and this enables us to produce mushrooms of exceptional quality,” commercial director Sergio Pinto told Fruitnet. Belgium’s Vergro was also at the event to showcase its rapidly expanding range of fruits and vegetables. The acquisition of Sint-Katelijne-Waver-based DVL last year enabled the company to boost its production of vegetables such as peppers, aubergines and courgettes and it is now looking to do more business with the UK retailers.